This wonderful Guild 12-string F-212XL guitar was made in the Westerly, Rhode Island, plant in 1976, judging from its serial number (137102) and the Guild website. It features a super-sized jumbo body based on the F-47 design and is probably the most powerful factory 12-string ever made and widely distributed in America. The F-212 was discontinued in 1985 and the F-212XL was initially discontinued in 1986; however, the XL was re-issued by popular request 1998-2000, and again from 2010 to the present. It’s just too darned strong to die! As such, this particular guitar has dominated lesser instruments for 41 years, and the resonance of its aged woods will only improve with its new generation of players. Its classic good looks make it stand out in any crowd, but it’s the huge sound that will make other players turn around to check it out. This Guild F-212XL has a solid spruce top and solid mahogany back, sides, and neck. The body is fully bound, top and back, with multi-stripe binding on top, and it has a large black pick guard, an ebony bridge, and a multi-stripe inlaid rosette. The three-piece mahogany/maple neck supports a 14/20 fret ebony fingerboard with no inlays which ends in a blackface headstock with Guild enclosed chrome tuners and the pearl inlaid Guild name and Chesterfield logo. It is a jumbo plus size, with a full 21” body length, 17” lower bout width, 5” body depth at the end pin, and a 25.5” scale. This particular guitar is entirely original, but after 41 years it’s not perfect. There are several professionally repaired cracks, including a hairline along each side of the fretboard to the sound hole—common in older 12-strings, and three cracks in the grain of the top lower bout, one of them rather conspicuous. 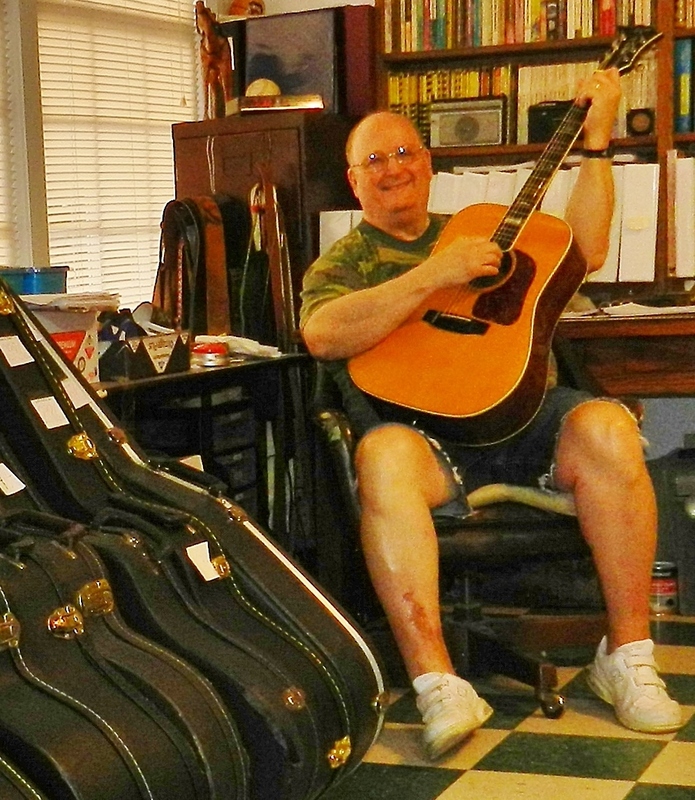 All of these have been professionally dealt with at one time or other, the guitar has been continuously played since these repairs, and my luthier certifies they are totally stable. In addition, the bridge has almost certainly been re-set, but again the repair is solid. Like all Guild 12-strings, this guy is built like a tank, good for generations to come. Cosmetically, there is a little of the finish “crazing” which one would expect in a hard-playing 41-year-old guitar’s finish, some buckle bruising on the back, and a few other dings or bruises which don’t show in the pictures. There is some slight finish chipping on the headstock, but the tuners are original and work perfectly, and the frets show relatively little wear. The neck is straight, and the action at the 12th fret is 4/32” at the 12th fret low E—standard for a 12-string. The black white-dot bridge pins are probably replacements, but everything else appears to be straight from the Guild factory 41 years ago. So this tone monster is ready to rule the world—or at least your local jam. It is a truly classic instrument, a real Guild, “Made to be Played,” and it has worked hard making music and beating up on banjo and fiddle players for over four decades. While it does show this experience, more importantly it sure does sound like it: all that resonance released from a body which has been specifically designed to create big sound. Lord willing and the creek don’t rise, this powerhouse will pass into the hands of players able to make music and turn heads for generations to come. The included arched-top hard shell case is obviously original, and it has protected this classic well. As a result, there are a few dings around the edges; however, the burgundy plush lining is soft and intact, the latches work perfectly, and the pocket is even in great shape. Like the guitar it protects, structurally the case is solid as a rock. It also fits like a glove and offers great protection for this wonderful vintage guitar. I have made every effort to describe and illustrate this vintage guitar and case with scrupulous accuracy. Please check out the pictures and ask any questions you might have before offering to buy it. Its return will not be accepted unless it can be shown that it was egregiously misrepresented in this listing. Thank you for your interest in this fine Guild guitar.